nine × eight = Required Please enter the correct value. Hot Stocks to Watch, June 13, 2014: OpenTable Inc. (Nasdaq: OPEN) stock is on fire today – up around 50% in trading on news of a deal with Priceline Group Inc. (Nasdaq: PCLN). Also topping today's hot stock news: It's Friday the 13th with a full moon, a rare occurrence that hasn't happened since 1919 and won't happen again until 2049, according to universetoday.com. Several studies have looked at the very plausible idea that the stock market might perform poorly on Friday the 13th, because of investors' superstitions. But, markets actually do slightly better, on average, than on others days. Regardless of moon activity and what the calendar says, the following 12 "hot stocks to watch" are poised to do better today thanks to company news, analysts' actions, and M&A activity. OpenTable Inc. (Nasdaq: OPEN) shares surged nearly 50% to a new high of $104.19 on brisk volume. Priceline Group Inc. (Nasdaq: PCLN) is buying the restaurant reservation service for $2.6 billion. PCLN, an online discount travel service giant, will pay $103 per share in cash, a 46% premium on OPEN's closing price on Thursday. "OpenTable is a great match for The Priceline Group," Darren Huston, Priceline chief executive officer, said in a statement. "They provide us with a natural extension into restaurant marketing services and a wonderful and highly valued booking experience for all our global customers." While PCLN shares slipped 1.2%, other companies in the online business sector moved higher. Review site Yelp Inc. (Nasdaq: YELP) shares surged 15% to $75.25. Daily deals site Groupon Inc. (Nasdaq: GRPN) shares climbed 5.58% to $6.39. 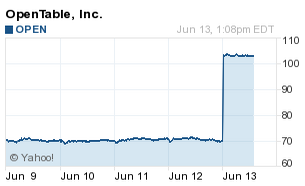 And, services evaluator Angie's List Inc. (Nasdaq: ANGI) shares rose 2% to $13.04. Abengoa Yield Plc. (Nasdaq: ABY) kicks off today's hot stocks to watch. The UK-based renewable energy company made its debut on the Nasdaq after pricing 24.85 million shares at $29 each. Shares opened at $35.16. By midmorning, following the successful initial public offering, ABY shares were up some 26% to $36.45.